Qualcomm Incorporated (NASDAQ:QCOM) announced that its subsidiary, Qualcomm Technologies, Inc., has introduced the new Qualcomm® Snapdragon™ 700 Mobile Platform Series, designed to exceed what is expected from today’s high-tier mobile experiences, with features and performance previously only available in the premium Snapdragon 800 Mobile Platform Series. Advances to be expected in the 700 Series include on-device AI supported by the Qualcomm® Artificial Intelligence (AI) Engine, and improvements to camera, device performance and power, supported by the heterogeneous compute power of premium features including the Qualcomm Spectra™ ISP, Qualcomm® Kryo™ CPU, Qualcomm® Hexagon™ Vector Processor and Qualcomm® Adreno™ Visual Processing subsystem. AI: Snapdragon 700 Series products will come with the multi-core Qualcomm AI Engine delivering up to 2x improvements for on-device AI applications compared to the Snapdragon 660 Mobile Platform. Through heterogeneous computing, the new architectures of the 700 Series – the Hexagon Vector Processor, Adreno Visual Processing subsystem, and Kryo CPU – work cooperatively to effortlessly capture and share videos, learn voice and speech and make your device last on a single charge without changing applications or settings. 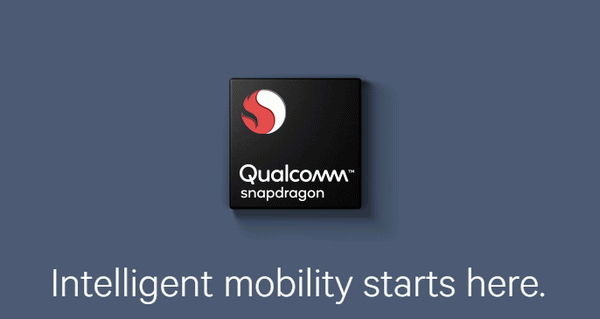 Camera: The Snapdragon 700 Series will unleash the limitless power of the Qualcomm Spectra ISP and make you love capturing your life experiences during all parts of the day and night, in slow-motion, or with the help of AI. Expect a multitude of additional professional grade camera features, supported by high-quality specs, to reside in the 700 Series. 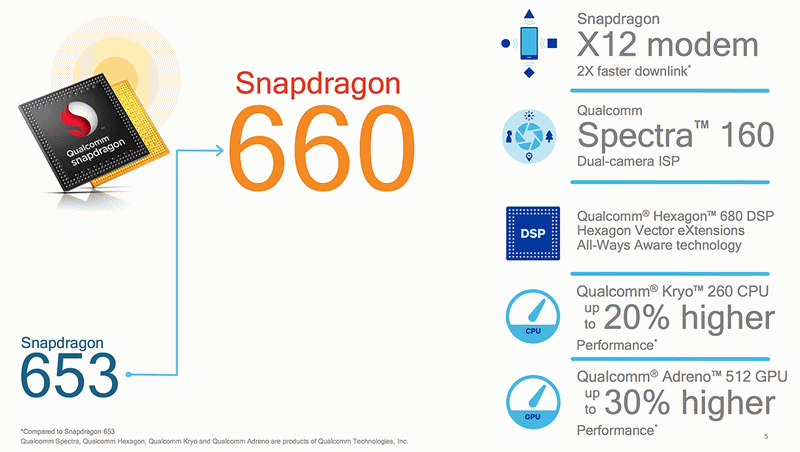 Performance and Battery: The Snapdragon 700 Series will debut new architectures across the mobile platform, including Qualcomm Spectra ISP, Kryo CPU and Adreno Visual Processing subsystem, which will offer up to 30% improvements in power efficiency, and better performance and battery life across numerous applications compared to the Snapdragon 660 Mobile Platform. 700 Series products will also benefit from Qualcomm® Quick Charge™ 4+ technology, engineered to get up to 50% charge in only 15 minutes*. 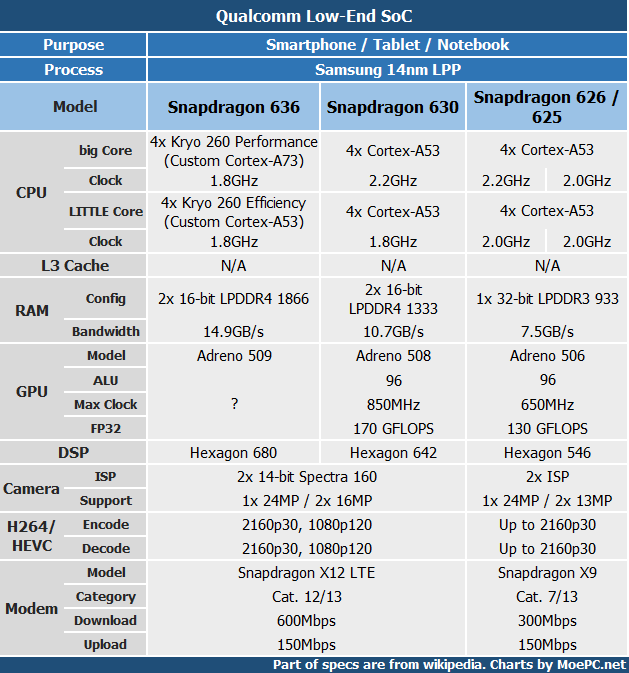 Connectivity: The Snapdragon 700 Tier will feature an advanced suite of wireless technologies with ultra-fast LTE, carrier Wi-Fi features, as well as enhanced Bluetooth 5. Commercial samples of the first Snapdragon 700 Series Mobile Platforms are anticipated to ship to customers 1H 2018. For more information please visit www.qualcomm.com/snapdragon. *Based on internal tests charging a 2750mAh fast charge battery and using the maximum power for a thermal limit of 40C for all charging implementations. Charge time based on 0% to 50% utilizing 2017 charging Implementations (September 2016). Certain Snapdragon mobile platforms are designed to allow devices to support 50% battery life with 15 minutes charging. Actual results may vary depending on device design. Feel free to use your Adblock, we don't have any ads. Foreign visitors, if you have any questions, leave a comment in English/Japanese/German.